The Namdini Mining Licence is located approximately 50km south-east of the regional town of Bolgatanga, the capital of the Bolgatanga Municipal District and Upper East Region of north Ghana. It is approximately 60km south of the Burkina Faso-Ghana border and 12 km from Cardinal’s Ndongo East Prospect. Namdini lies within the Nangodi Greenstone Belt, one of a series of southwest – northeast trending granite-greenstone belts which host significant gold mineralization in Ghana and Burkina Faso. Mining activities around the Namdini licence attest to the gold bearing potential of this whole area. Cardinal is currently executing studies on the Namdini Gold Project with Golder Associates for the mine design, Lycopodium for the process and infrastructure design and Knight Piesold for the tailings storage facility design. Metallurgical testwork is currently being performed by ALS in their Perth laboratory. The nearest airport is in Tamale, approximately a two-hour drive south of Bolgatanga via 160km of sealed road. Tamale is serviced by daily one-hour scheduled commercial flights from Accra. Travel time from Accra to the project is approximately four hours using a combination of air and road travel, and around 14 hours solely by road travel. Cardinal holds a 100% interest in the Large-scale Mining Licence covering 19.54km2 of its Namdini Project. 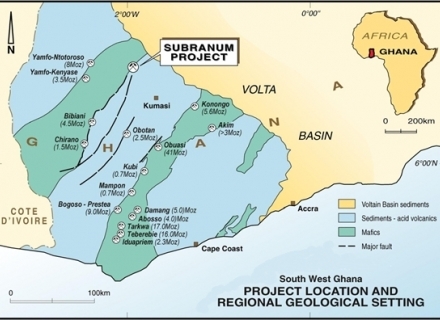 During the December 2017 quarter, a Large-Scale Mining Licence covering the Namdini Mining Lease was assigned to Cardinal Namdini Mining Limited, a wholly owned subsidiary of Cardinal, by the Minister of Lands and Natural Resources under the regulations of the Minerals and Mining Act of Ghana 2006 (Act 703). The Large-Scale Mining Licence is valid for an initial period of 15 years and is renewable for a further 30 years. The mean annual temperature in Bolgatanga is 28°C, and the area is subject to a rainy season between May and October. The topography of the Namdini area is generally flat to gently undulating and rises to the south where the area is overlain by sediments. Elevation varies from 175 to 250 m above sea level with average elevation at approximately 190 m. The project area is primarily savannah grassland. The Namdini gold deposit is a large, structurally-controlled, orogenic gold deposit, typical of many gold deposits in the West African late-Proterozoic Birimian terranes. 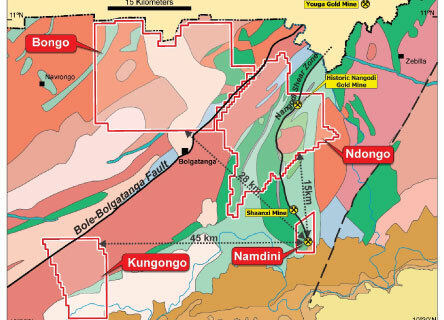 Namdini lies within the Nangodi greenstone belt, one of a series of south-west/north-east-trending metavolcanics, volcaniclastics and metasediments that host significant gold mineralisation in Ghana and Burkina Faso, including the Youga mine 40km to the north, now owned by MNG Gold and formerly by Endeavour Mining. The Nangodi greenstone belt is associated with a major north/south-trending shear zone that is a splay off the main regional Bole Bolgatanga Shear. Although the presence of gold in the region was recorded in the 1930s, modern regional exploration prior to Savannah Mining’s discovery of the deposit through prospecting in September 2013 was limited to regional geophysical surveys. 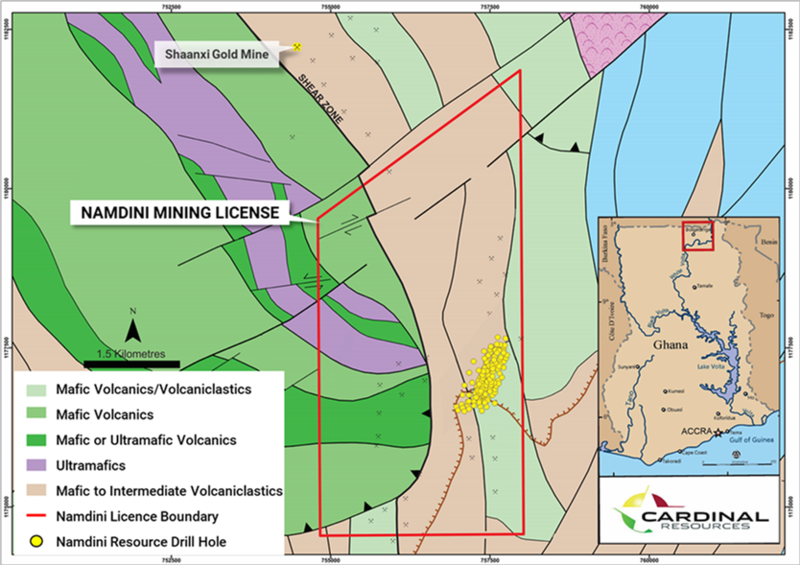 Cardinal signed an agreement with Savannah over the Namdini area in July 2014, and commenced drilling later that same month, with the first results announced in August 2014. Drilling continued throughout 2015 and 2016 and the maiden resource for the project was announced in November 2016. Follow-up exploration in the area has included aeromagnetic surveying, regional- and prospect-scale geological mapping and rock chip sampling. Ground magnetic and induced polarisation surveys and subsequent geological and structural interpretations were completed over the deposit in 2016. The company has also undertaken a large auger drilling programme over the whole project area. The Nangodi Belt has been intruded by granitic rocks (tonalite) and later by quartz diorite. At Namdini, the metasedimentary and volcaniclastic rocks of the belt have been intensely hydrothermally altered with pyrite-carbonate and muscovite-chlorite-quartz assemblages. The granite is also extensively altered and has been overprinted by a silica-sericite-carbonate assemblage. 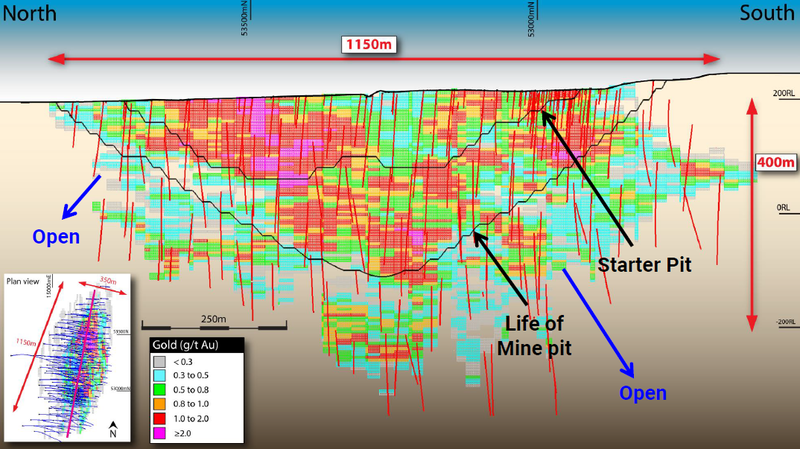 The mineralised domain is interpreted on the basis of 2m composites with a gold grade in excess of 0.1 g/t. The resulting domain trends north-north-east over a strike length of 1.2km and a width of 350m. The domain dips to the west at around 60º and has been intersected by drilling to a maximum depth of around 650m, where it remains open. Perspective view of the Namdini Gold Mineralised envelope. Mineralisation is very fine grained and is associated with visible disseminated sulphides (predominantly pyrite) in narrow, folded quartz-carbonate veins and the surrounding rocks. Visible gold is present, but rare. 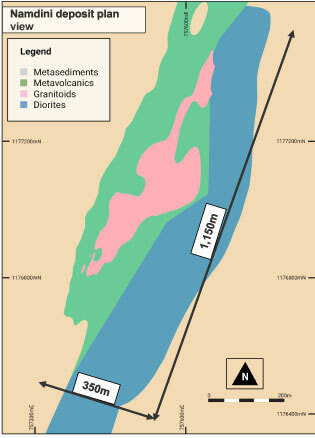 Higher‐grade mineralisation (>0.5 g/t Au) can be traced along structural corridors related to NW‐SE foliation, and is widespread within the metavolcanics (approximately 60% of the contained gold), granite (approximately 30%) and diorite (approximately 10%) lithologies. Depth to the base of oxidation averages approximately 10m. The partially oxidised transition zone extends to fresh rock at an average depth of 18m. Total resources for the Namdini Project has increased from 3.9Moz in November 2016 to 7.0Moz announced in March 2018. All four resource estimates are JORC-compliant and the two most recent statements are also compliant with Canadian Institute of Mining, Metallurgy and Petroleum (CIM) definition standards. The following figures show long sections and cross sections giving the resource categorisation from the September 2017 resource and from the updated resource of March 2018. These are presented on similar scales. Note that the location of both the long sections and the cross sections are slightly different and that these sections are not therefore directly comparable. The resource estimate of March 2018 was completed by MPR Geological Consultants of Perth and comprised a total of 193Mt grading 1.1 g/t for 7.0Moz of contained gold. 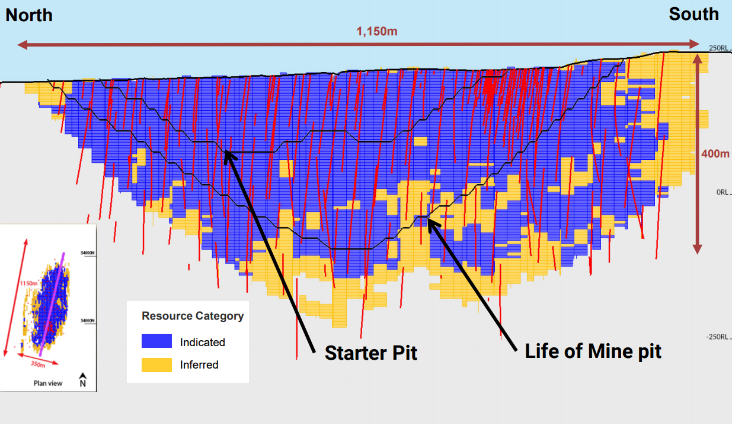 Following the completion of the September 2017 resource, on which the PEA was completed, the focus of resource drilling turned from resource expansion to infilling to upgrade Inferred resources to the Indicated category in anticipation of the completion of further studies. The March 2018 resource included an additional 15,684m of drilling in 35 holes, taking the total resource database to 84,975m of drilling in 310 holes. The resource successfully increased the Inferred resource from 58% of the total resource to 93%; however, the total amount of gold in the overall resource fell by 5%, or 390,000oz, to 7.0Moz. The resource is constrained by an optimal pit shell based on a long‐term gold price of US$1,500/oz and the reported resource uses a marginal cut-off of 0.5 g/t that was established using a gold price of US$1,300/oz. A breakdown included in the September 2017 resource estimate showed that approximately 300,000oz (4%) of the gold in the overall resource was contained within either oxide or transition material. The resource was estimated using Multiple Indicator Kriging (MIK) with block support adjustment. Resources include a variance adjustment to estimate recoverable resources. The variance adjustment is made using a log-normal distribution, to give an estimate of the recoverable resources at various cut-off grades and is applied to estimate recoverable resources assuming closer spaced grade control sampling will take place. Geostatistical analysis indicates that gold grades at Namdini are highly variable and are positively skewed with a long tail of assay grades above the mean. MIK is considered to be the most appropriate method for this type of grade distribution and for a wide range of geological styles, including structurally-controlled gold deposits such as Namdini. The resource was checked against an alternative Ordinary Kriged model, with the results within estimation accuracy. For the purposes of the resource estimate, within the overall 0.1 g/t mineralised domain mineralisation is not further constrained by structure or lithology. This is due to the observations that mineralisation is not associated with traceable structures within the domain, nor is it constrained within specific lithologies; it appears to cross lithological boundaries with little impact. In summary, the resource estimate considers Namdini to be a disseminated gold deposit, with large volumes of pervasive gold mineralisation above the cut-off grade. The resource estimate, and the adjustments for mining dilution in particular, benefited from a trial-grade control drilling programme that was conducted in December 2017. 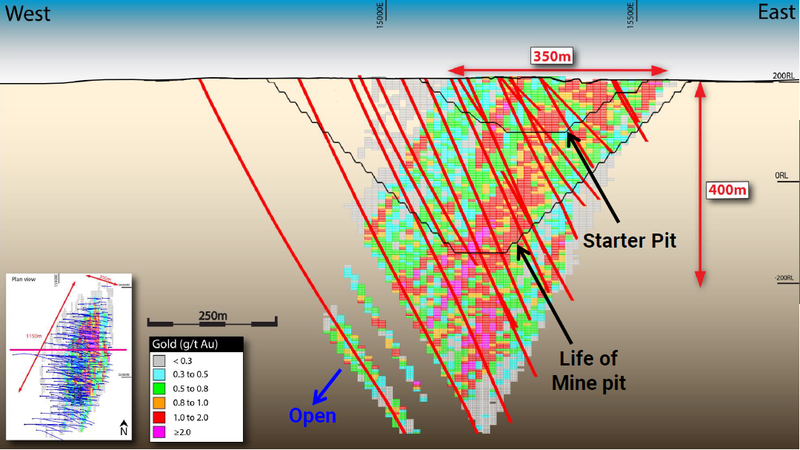 This comprised 13,271m of RC drilling in 317 RC holes drilled on 10m by 15m centres in the targeted starter pit area. The programme covered an area of 350m by 200m, to an inclined depth of approximately 42m. The reconciliation with tonnage, grade and contained ounces in the resource estimate was reported to be very accurate. In July 2017 the Phase 2 test-work results showed that recoveries of 86% were expected from a sulphide flotation/re-grind/CIL processing route, using representative life of mine samples and more thorough testing. Phase 3 test-work is underway to further optimise the process design and parameters. Cardinal announced the results of the Preliminary Economic Assessment (PEA) on the Namdini Project on 5 February 2018. The study was completed by Golder Associates, which undertook the resource review and the mining and environmental aspects of the project. 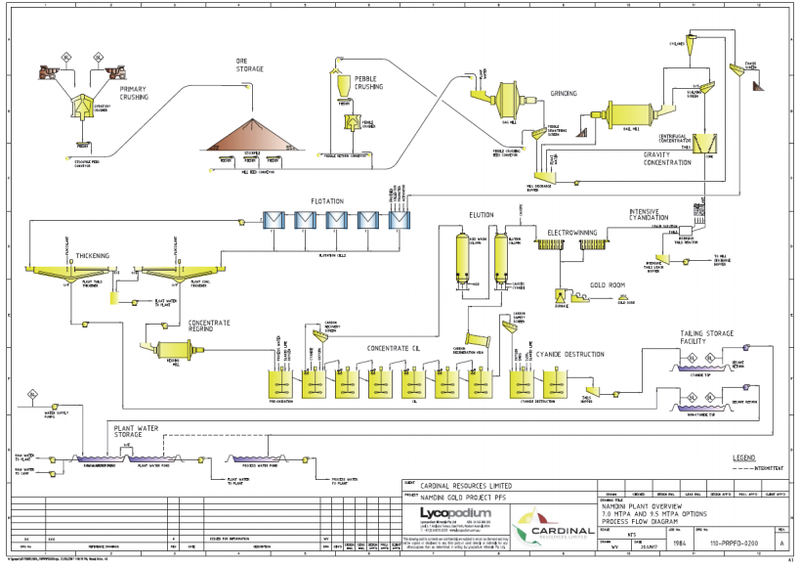 Lycopodium was responsible for the processing and infrastructure section of the study. The study was based on the development of a single open-pit mine feeding a conventional crushing, SAG mill, flotation and CIL circuit. The project evaluated three throughput rates (4.5, 7.0 and 9.5Mtpa), each of which returned positive results. The final development scale has yet to be chosen. The PEA was based on the resource as of September 2017, comprising a total of 205Mt grading 1.12 g/t for 7.4Moz of contained gold, of which 58% was in the Indicated category. 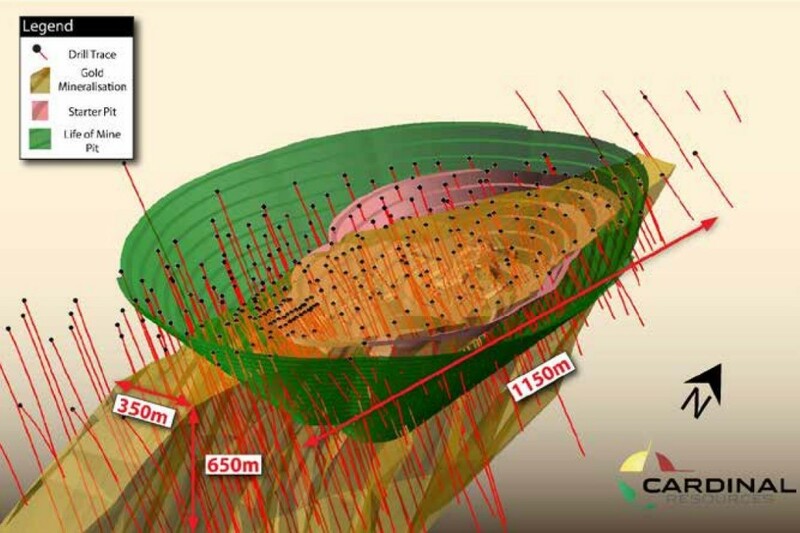 The production target in the PEA totalled 113Mt grading 1.13 g/t and containing 4.1Moz of gold, of which 81% was Indicated and 19% Inferred. The PEA assumed conventional, contract-operated, open-pit mining of a single pit. The disseminated style of mineralisation and grade distribution at Namdini has implications for the mining method and indicates that bulk with a lower cut-off grade is likely to be more effective than selective mining at elevated cut-off grades. The study proposed the use of large-scale equipment (up to 600t excavators and 200t trucks), offering the prospect of significant economies of scale. A minimum mining width of 100m was also assumed. Golder conducted an initial geotechnical assessment, as a result of which it estimated overall pit angles of 40º and 45 º for oxide and fresh rock respectively. The resulting waste-to-ore ratio was 1.2:1. The limited oxide and transition material (likely to contain 0.3Moz of the mineable 4.0Moz) will be stockpiled and processed through the CIL portion of the processing plant in campaigns. 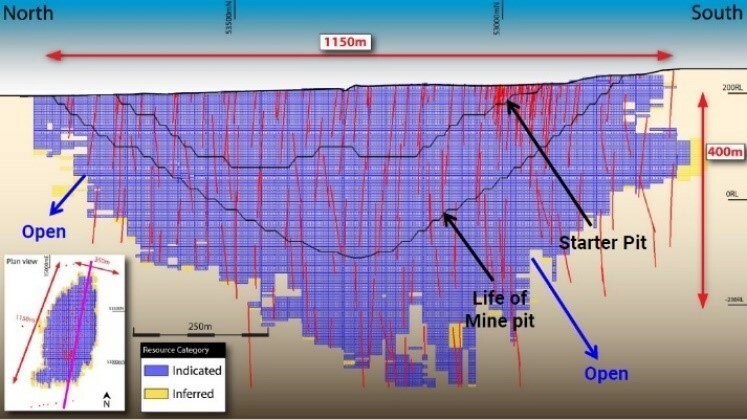 There is expected to be limited free dig material, with most requiring drilling and blasting, with grade control drilling on 15m by 10m assumed. 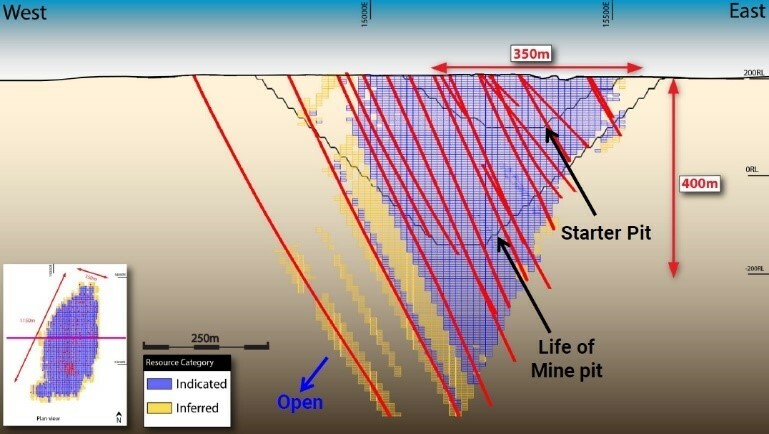 The study also assumed that the project will initially focus on a high-grade starter pit area towards the north of the deposit. This is expected to produce in the region of 400,000-900,000oz of gold over a 3 to 4-year period at a grade range between 1.2 to 1.6 g/t, helping to boost the project’s return and reduce its payback period. 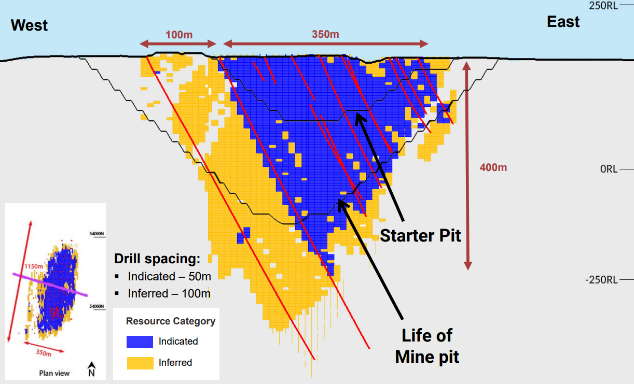 The mining of the starter pit is also likely to be undertaken in conjunction with a cut-off management and stockpiling strategy that could see an elevated cut-off of up to 0.8 g/t used in the early years to further improve returns, compared with the project’s overall cut-off grade of 0.5 g/t. The contract mining rate of US$3.26/t mined (equivalent to US$7.17/t processed) is based on in-country contractor quotes. As described earlier, the processing route comprised single-staged crushing, milling (open circuit SAG mill with recycle pebble crushing followed by closed circuit ball mill/hydrocyclones) with an initial grind size of 106 microns, a gravity gold recovery circuit, sulphide flotation to a low mass sulphide concentrate (5-10% of the total volume), re-grind of the sulphide concentrate circuit and CIL cyanidation of the reground sulphide concentrate. Recoveries of 86% were assumed for fresh rock and 90% for the oxide material, assuming that that is processed through the CIL plant directly (without passing through the flotation circuit) in campaigns. Processing costs were estimated to range from US$11.60/t to US$10.10/t depending on the scale of the development. Estimated G&A costs were equivalent to US$1.90/t to US$1.20/t. Stockpile reclaim costs were estimated at US$1.50/t for the 12% of the total resource mined that is re-handled. An additional cost of US$1.60/t was allowed for in the first couple of years (ie, until the operation reached steady-state). The project area is readily accessible from Bolgatanga along a sealed highway followed by 20km of gravel roads. The main access roads are passable year-round but would require upgrading prior to project development. The national power grid 161 kV above-ground transmission line runs approximately 30 km west of the Namdini Gold Project. The project will tie into this power line via a build own operate arrangement with a third party to minimise upfront capital costs. The average power consumption is expected to be from 24MW to 48MW depending on the scale of development, equivalent to approximately 5MW/Mtpa of throughput. It is assumed that power is provided at the mine site at an over the fence cost of US$0.15/kwHr, based on recent quotations. The project is planned to take power from the main line carrying power for export to Burkina Faso. This line is considered to be stable and reliable. The company is in discussions with the Ghana Grid Company Ltd (GRIDCo) and other service providers, regarding the provision of power. The PEA provided for limited back-up power generating capacity on site to cover critical plant operations. Water will be pumped ~7km from the White Volta River, providing a year-round supply to site. An environmental study was completed to scoping study level by NEMAS Consult Ltd (NEMAS) of Accra, Ghana, was delivered to the Ghanaian authorities in June 2017. NEMAS is updating the study to PFS and DFS study levels. One of the key areas of focus for the environmental study is the containment of the acid-generating, sulphide-rich tailings from the CIL plant. We note that these tailings are derived from the sulphide concentrate, which accounts for 5-10% of the total volume of material processed at the project, limiting the required scale of the concentrate tailings storage facility. The only community immediately affected by the proposed project development is an informal settlement of approximately 125 small-scale miners and their families at the northern end of the planned open pit. This community will be the subject of a resettlement action plan. All capital and operating cost estimates were based on comparisons with similar operations and estimates provided by mining and engineering contractors. We also note that Golder, Lycopodium, Knight Piesold and other contractors contributing to the PEA, have considerable first-hand experience of West African gold project developments and are in a good position to benchmark cost estimates to ensure these are realistic. Three throughput rates were assessed — namely 4.5, 7.0 and 9.5Mtpa. No decisions regarding the scale of development have yet been taken. Although higher throughputs generate higher returns, we expect that the availability of capital for the project’s development may determine its initial scale and that a staged development with an expansion of the project funded from cashflow is also an option. In each case, 3.5Moz of gold are recovered over long mine lives of 27 to 14 years. Average annual gold milled is planned to be 159,000oz, 211,000oz or 333,000oz pa (based on full production years) depending on the development scenario. Initial capital costs were estimated at from US$275m to US$426m depending on the scale. The resulting capital intensities are very attractive and benefit from economies of scale, the assumption of contract mining and the provision of grid power to the site. All-in sustaining costs (AISC) include a royalty of 5% and sustaining costs that are equivalent to around US$40/oz of gold produced over the life of the operation. The base case economic analysis assumed a gold price of US$1,300/oz and a profit tax rate of 35%. The competitive AISC, very attractive capital intensity and the presence of a high-grade starter pit combined to deliver a high post-tax internal rate of return of between 31-44%.